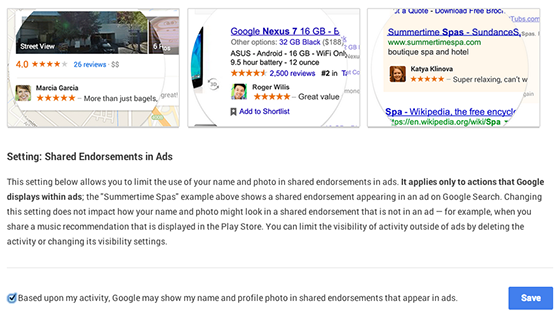 Google changed its terms of service recently to make all comments, +1s and follows useable as “shared endorsements”. To put it plainly, any of the aforementioned item review methods can now be used to target your friends and get them to buy products you openly like. When searching for a product or checking out an establishment on Google Maps, your review will be front and center to persuade them into making a particular purchase. The changes won’t take place until November 11th, and anyone under the age of 18 will automatically be opted out of the new advertisement program. People who chose not to share their +1s with friends will also be opted out of the program and not used for advertisement purposes. Google isn’t trying to pull a fast one on us. In fact it wants to make sure everyone is aware of the change before it takes effect. They’re simply using Google+ to do the same thing Facebook has been doing for years now. I don’t really see any issue with it either. It’s not like you weren’t going to look at the comments and all anyway. At least this way you’re being given the opinion of people you know rather than complete strangers.